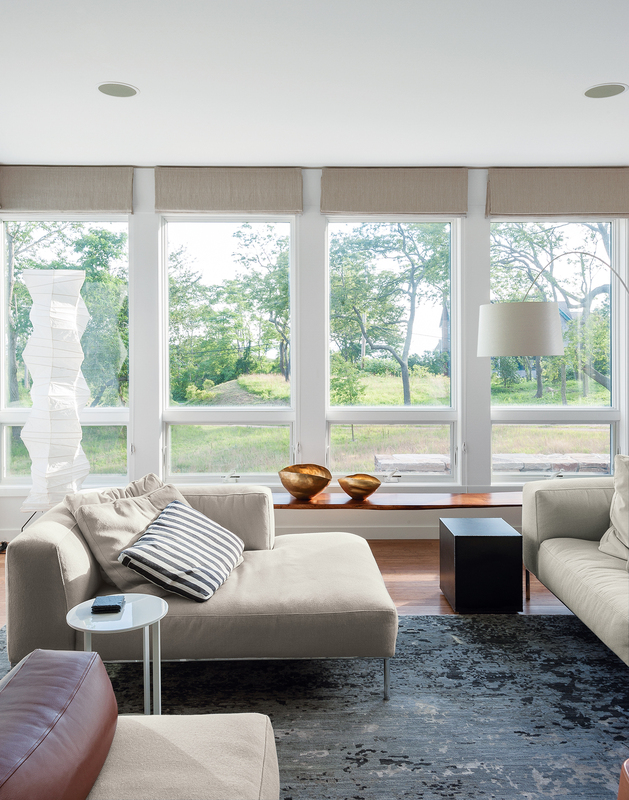 Resolution: 4 Architecture designed a Fishers Island home with warm cedar siding and white windows as a nod to the regional New England vernacular. The modular system created by the architects at Resolution: 4 allows them to customize a home’s floor plan by stacking, lining up, and joining factory-built, rectangular modules. 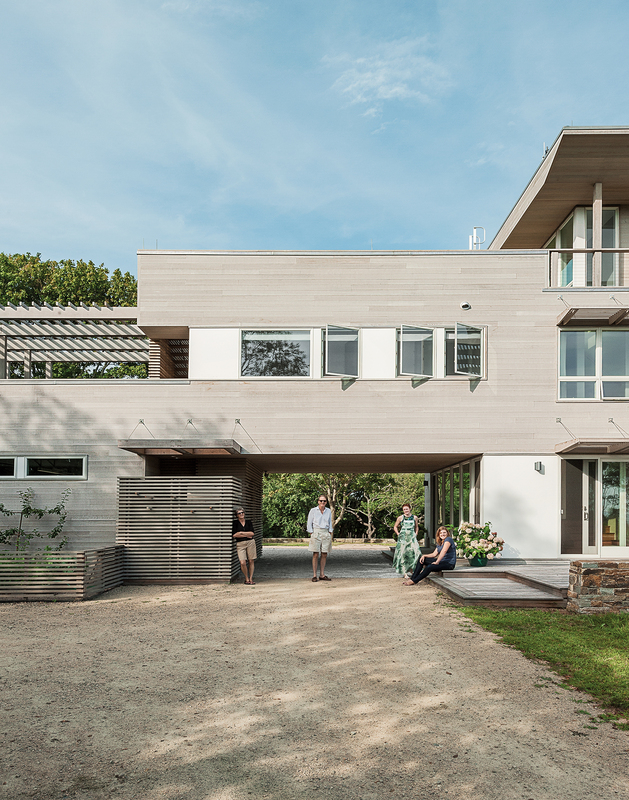 This is the largest prefab house the firm has completed to date with eight modules amassing around 4,500 square feet. The fireplace wall, a Resolution: 4 signature, is made of 14-gauge hot-rolled steel panels with storage components in one-eighth welded steel. On one side is a pivoting privacy panel that allows the guest wing to be closed off. Art attaches to the metal with magnets. 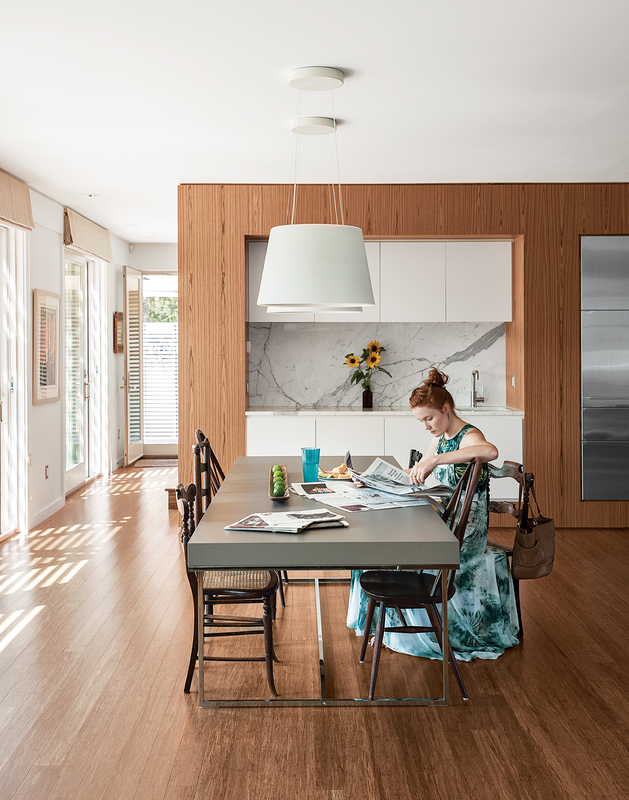 The firm collaborated with Kountry Kraft and its modular manufacturer, Simplex Homes, to expand the palette of materials, including the teak cabinetry used in the kitchen and dining areas. Interior designer David Bentheim suggested the marble backsplash for the bar area. Antique dining chairs, an LED Aurea pendant lamp by FontanaArte, and a Paolo Piva table from B&B Italia complete the room. An Alcova bed from B&B Italia dominates the master bedroom. 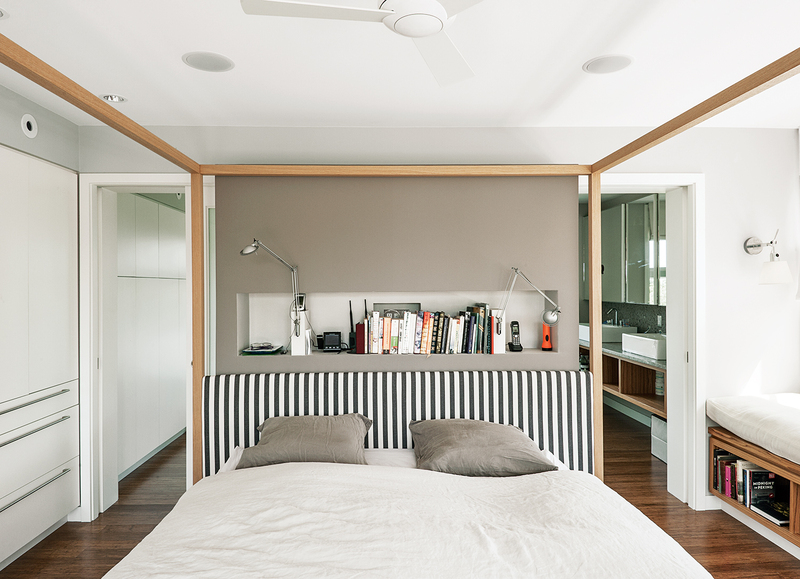 A niche behind the bed holds Berenice wall lamps by Luceplan, and the walls are painted in Cornforth White and Charleston Gray from Farrow & Ball. A second green roof is planted with sedum and plays host to one of the family’s favorite spots: a hammock. Bentheim suggested adding a trellis overhead to soften and balance the appearance of the facade. The two-foot-thick stacked stone walls constructed by Reed Hilderbrand nod to the masonry-free walls common in Revolutionary-era New England. It all started with a 12-foot stepladder, balanced somewhat precariously on the bed of a pickup truck. Joseph Tanney and Robert Luntz of the Manhattan firm Resolution: 4 Architecture were on Fishers Island, New York, for their first look at the three-acre lot where they were to design a second home for Mimi Parsons and Tom Siebens, an American couple who keep their primary residence in the Notting Hill section of London. They arrived to find that Parsons’s father, Harris, had driven his Chevrolet pickup to a clearing and erected a ladder in the back, hoping to give Tanney and Luntz a sense of the site’s magnificent views of Long Island Sound. Capturing those views was paramount to Parsons, 61, who grew up in Rhode Island and has spent her summers on Fishers Island since childhood, and Siebens, 62, who met his future wife after he came to the island to teach sailing when they were both barely out of their teens. Another priority was to create an open kitchen, dining, and living area large enough to accommodate as many as 40 guests—Parsons’s parents and her four brothers and their families all have houses on the island—at Thanksgiving and Christmas. The house would also give their 24-year-old twin daughters, Hannah and Mackie, a home base in the United States while their parents are in London. After renting a rambling, shingled house just downhill from their current property for several summers, they bought their lot from one of Parsons’s brothers in March 2007 and began thinking seriously about what to do with it. 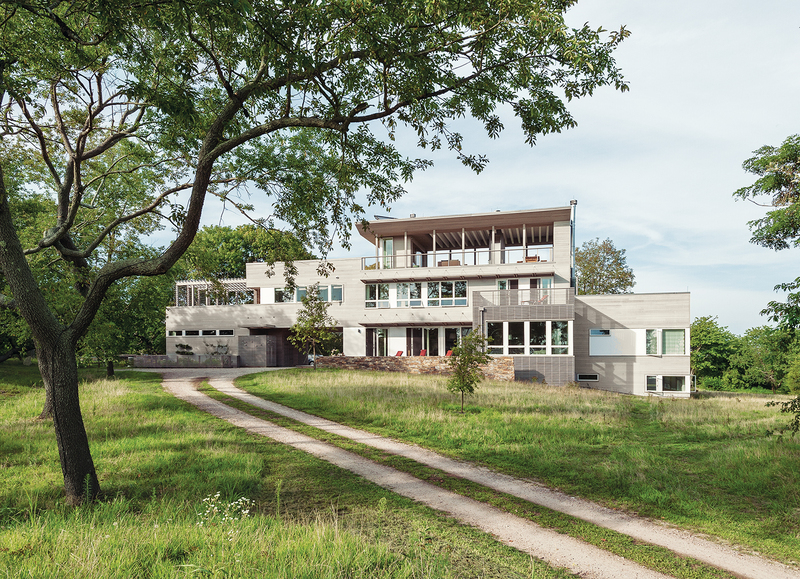 Because of the logistical challenges of building on Fishers Island—which is officially part of Long Island but accessible only by infrequent 45-minute ferry trips from New London, Connecticut—Parsons and Siebens reasoned that modular construction would be relatively simple and less expensive. Their research led them to the team at Resolution: 4, which has spent a decade refining what Tanney calls a system of “mass customization”: Prefabricated modules are inexpensively built and outfitted with fixtures in a factory, delivered to a site by truck, and configured to meet a client’s lifestyle and budget. Getting concrete mixers on and off the island by boat was virtually out of the question, so Tanney and Luntz specified a prefabricated foundation and arranged to put the slabs on the ferry with the help of Baby Doll, the general contractor. The ferry operator confirmed that the boats could accommodate the 16-foot-wide modules that comply with federal shipping regulations, as long as the modules were arranged two abreast and delivered before Memorial Day weekend—when the island’s population begins its annual surge to around 2,000 from fewer than 300. Tanney credits Siebens with suggesting that they measure the island gangplank, which, as it happened, was too narrow, forcing Tanney and Luntz to reduce the width of the boxes to 12 and 14 feet. The eight modules were delivered to the island over the course of two days in mid-May 2011. It took another two days to set them in place with a crane. Eleven months later—after the bamboo floors were installed, the exterior clad with cedar siding, the roof deck completed, and the furniture installed—the family spent their first night in their new house. Since the home was put together, Parsons, who worked in advertising sales, and Siebens, a former finance lawyer, have settled into a retirement routine. They divide their time between London, where Siebens says they expect to live “until we’re too old to get on airplanes,” and Fishers Island. The glorious seascapes and family ties exert a strong pull and make the frustrations of getting there—international air travel and fretting about missing the day’s last ferry while stuck in traffic on Interstate 95—worth every ounce of effort.